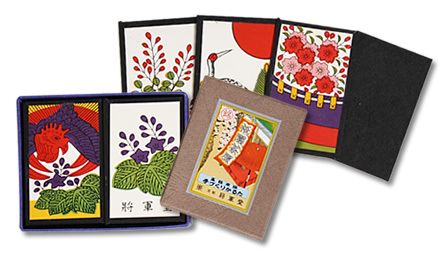 Hana karuta cards are better made both in form and in design than regular playing cards, and can be said to be the finest playing cards created in Japan. 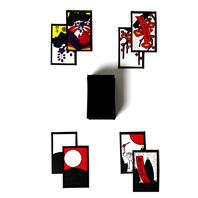 These cards are also referred to as hanafuda cards, after the traditional Japanese game that uses them. Neither too big nor too small, they have a sturdy thickness that makes them pleasant to hold. One deck consists of 48 cards, divided into 12 sets of four each of the same plant. The particular design drawn on each card determines its value. 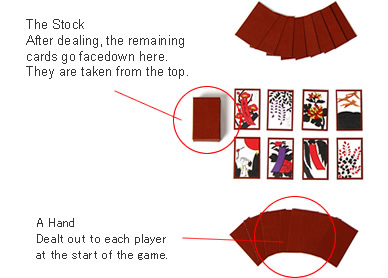 The 48 card size is believed to be a carryover from the first Portuguese decks of cards brought to Japan, but unlike regular playing cards the values of the hanafuda cards are irregular and not consistent between suits. Hana karuta is an intellectual game requiring cool, strategy and daring, as one tries to determine the opponents' cards and the remaining cards while keeping one's own hand and the cards one desires a secret. Hanafuda is a game with employment of one's deductive powers and intuition at its core, but part of its value also lies in enjoying the images of flora from all seasons of the year. The Japanese word "karuta" comes from the name of the Portuguese card game "carta." Cards bought to Japan from Portugal in the sixteenth century were developed into the Japanese games "Tenshou karuta" and "Unsun karuta", but the playing of them by the lower classes was banned by the Tokugawa Shogunate. As a result, people created secret areas inside shops to gamble away from the eyes of their rulers. Upon entering such a shop and giving the correct sign by scratching one's nose, the customer would be ushered deeper into the shop to the gambling area. During the Edo era, cards spread from the lower classes to the general populace and became popular instruments of gambling along with dice, resulting in updated laws to ban them. At this point, hana karuta cards were created as a non-prohibited substitute, although the explosive popularity they subsequently enjoyed was itself a result of their ready applicability to gambling. As they spread throughout the country, a variety of local games that used them were created. A game of matching the cards in one's hand and those in the stock to score points. When a player runs out of cards the deck will also be exhausted, and at that point the game ends. If playing with only two players, cards are taken from the deck until it is exhausted, at which point the game ends. At the end the points taken are totaled, and the winner is determined. 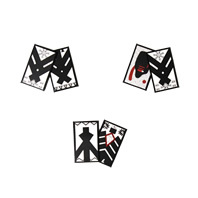 In some rules sets, points are gained for cards possessed and sets made at the end; in other rules variations, the points for a set are scored as soon as it is made. The dealer and other player take turns just as in hana-awase. When a set is assembled, the player who made it has the choice of stopping there or of continuing the game. When a player anticipates achieving a bigger set than they already have, they say "Koi-Koi" to indicate the game will continue--hence the game's name. However, if the other player manages to make a set before the anticipated set is achieved, the points that had already been collected are forfeited to the opponent. If you think you can collect more points, go for it! If it looks like the opponent is getting close to making a set, perhaps it's better to stop. The victor becomes the dealer for the next game. If neither player managed to complete a set, however, a "no game" is declared and the position of dealer switches. Oicho-kabu is also called simply "kabu." 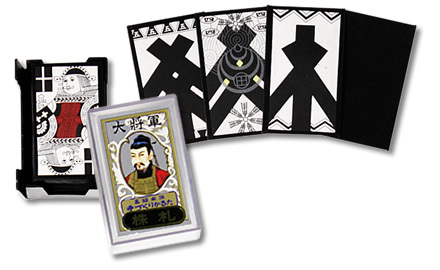 it can also be played with regular playing cards, and special "kabufuda" cards made in the same size as regular hana karuta cards. As in blackjack, it is a game of player versus dealer. Participants bet on one to three of the hands dealt, with a hand being better the closer its total is to 9 (without going over). The flow of points is between the players and dealer, and the dealer must face all the players. Only the players are able to choose the distribution of the bets. Every aspect of this item is of the highest quality, down to the beautiful paulownia wood box. 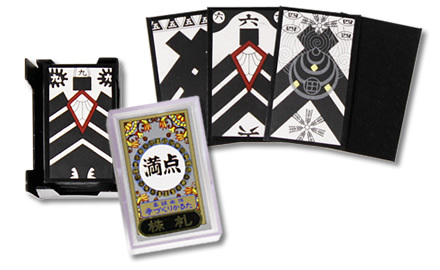 The cards are created using glue that contains earth, so they have a weight that makes them durable and easy to play with, and their backs are hand-made Mino paper. The package design takes as its inspiration a teahouse in the Gion geisha district of the Japanese city of Kyoto. These cards are slightly larger than normal ones, making them even easier to see and play with. The special images have a real presence. 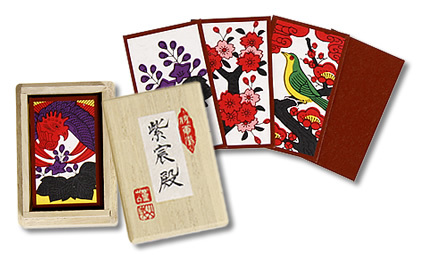 These "Dai-Shogun" and "Perfect Score" kabufuda cards use high-quality hand-made Mino Japanese paper. They are designed especially for the game "oicho-kabu." Enjoy a game with a true feel of authenticity.